If you’ve lived in the Tampa Bay area for any time at all, you know we need air conditioning to stay cool and comfortable. Whether you are moving into new construction and need a new AC installed, your current air conditioner is not performing as it should and needs service, or it is time to replace your old AC with a new one, Complete Pro Air is here to provide fast and professional service. We offer a 100% satisfaction guarantee. If you aren’t happy, neither are we! We take pride in our work and make sure that every customer is happy. Our technicians have the skill and experience needed to assess your situation and make the right recommendations for you. We show up on time and do a fast, thorough and professional job. You need to feel safe and comfortable with the technicians who come to work in your Apollo Beach home or business. Our workers arrive on time, professionally dressed and ready to do the job. For our customers’ safety and comfort, every one of our technicians is background checked and drug tested before joining us in the field. We work with technicians who possess EPA and NATE certifications. Our workers have experience with a range of systems and manufacturers. 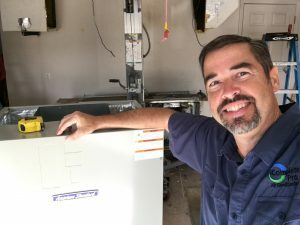 This level of skill and experience means that we can find out quickly what is going on and help you get your home or business cool and comfortable again. To run properly and efficiently, your air conditioner should be cleaned and serviced regularly. We offer inspections and maintenance services to ensure that your system runs longer and keeps your place cooler. While an air conditioning unit, when serviced regularly and well-maintained, can last for many years, they do not last forever. After many years of use, an air conditioning system does not work as efficiently, leading to less cooling power and more expensive operation. We offer free estimates on all air conditioning unit replacements. There is no obligation on this estimate. We want you to understand your options thoroughly so that you can make the right decision for your budget and your home or business. Whether you need an emergency repair, air conditioner maintenance or a new AC unit, we are here to help. We provide fast and professional service in Apollo Beach and throughout the Tampa Bay area. Call today.